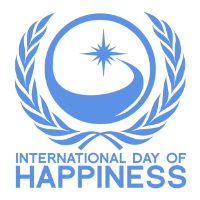 Well, I wanted to get a prompt out there that wasn't related to a specific day on the calendar but when it's International Day of Happiness, it's just a no-brainer, isn't it? Therefore today, I'd like you to be inspired by International Day of Happiness. Happiness is good for us - we all know that - and as scrapbookers, I know that we often record the little, and big, things that make us happy. And I know that we've had prompts around happy and happiness before, so how could we take this prompt in a different way today? Well, you could talk about what you do to bring happiness into your home. Perhaps you are fan of the Danish concept of "Hygge" which is thought to be the reason that they have been the happiest people on earth the last few years (Norway has just knocked them off the top spot for this year!). The top five happiest countries in the world include 4 northern countries - Norway, Denmark, Iceland and Finland - so why not think about being inspired by these lands - cold on the outside but clearly warm on the inside! Perhaps you'd like to create your own happiness index as in Bhutan and record that on your project. Perhaps there's something in your life that brings you much happiness but it's something that others don't really understand - surely a snippet of you to bring to the page. Hopefully, you can find a jumping off point right here for your happy page! You can either upload your layout into the Whimsical Musings Flickr gallery with the tag WM#252 or you can post it in our Whimsical Musings Facebook group. We've decided that we'll save albums for special occasions so just load up your photo to the group with the tag WM#252 in the write up text so that we can find it.